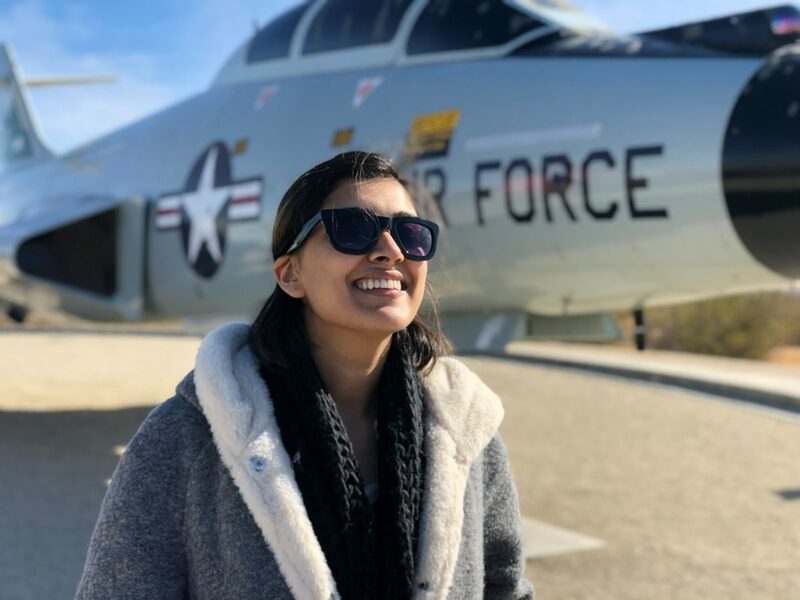 Tanya is gliding through her internship at NASA’s Armstrong Flight Research Center while working on just that — a glider, intended to fly across Mars! Hi there! My name is Tanya Gupta and I am a senior studying Mechanical Engineering at NYU’s Tandon School of Engineering. This spring, I am serving as the Ops Lead on the PRANDTL-M (Preliminary Research Aerodynamic Design to Land on Mars) aircraft at Armstrong Flight Research Center. The mission of the PRANDTL-M is to implement Ludwig Prandtl’s 1933 bird based wing design on an aircraft that is intended to perform the first ever Martian flight. To give some perspective, the Curiosity mission to Mars jettisoned the rover with a 140-pound tungsten weight from its back shell in order to balance the asymmetrical weight of the device. PRANDTL-M hopes to replace this dead weight on future Mars missions with something more useful, like a glider that will acquire data of Martian atmosphere and potentially perform spatial mapping of the surface. 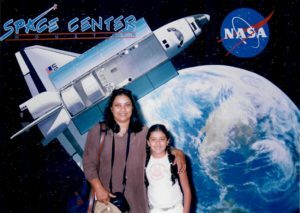 A young Tanya Gupta and her mother smile at Space Center Houston in 2005, just the beginning of Tanya’s exciting future with NASA. From the moment I got to Armstrong, I felt incredibly welcomed and treated with respect. My project mentor and coworkers have made me feel more than qualified and helped me build confidence in my abilities as an engineer. My opinion here is valued just as much as everyone else’s, which I believe to be a rare quality to find in an internship, especially one operating at such a high level. In addition to that, I believe in the value of encouraging women to pursue STEM, recognizing that reinforcement breeds excellence – and I am grateful that NASA shares this sentiment. One of my many mentors is Al Bowers, who is the expert on Prandtl’s alternative wing theory. Al is the Chief Scientist of Armstrong, which you would imagine would make him incredibly intimidating. To the contrary, he’s made us interns feel right at home from the start. He’s also the coolest person I’ve ever met – which I decided one day when he casually told me about the time he hung out with Buzz Aldrin. If there is anything I would like to take away from my experience with Al, it’s that I hope to be half as dedicated, half as intelligent, and half as passionate about my career as him when I’m his age. And perhaps one day I will – after all, he began his journey at NASA as an intern, too. On a tour, Tanya was fortunate to snap a photo in front of her favorite plane, the Global Hawk. Personally, my ideal career path is to work in the field of virtual and augmented reality. Before coming here, I didn’t know how this internship would necessarily help me in my goal, but I’ve learned that aerospace is in fact a leading industry for this technology. Armstrong also has an amazing set of flight simulators that I’ve been fortunate enough to encounter firsthand – I even got to do a couple of barrel rolls on an F-15! Since PRANDTL-M is a Unmanned Aircraft Systems project, I’ve learned about the potential benefits of VR components on unmanned missions. Imagine a totally unmanned spacecraft, millions of miles into space, controlled virtually. We might soon find that fact is, truly, stranger than science fiction. I can’t wait to see what NASA does with this emerging technology. 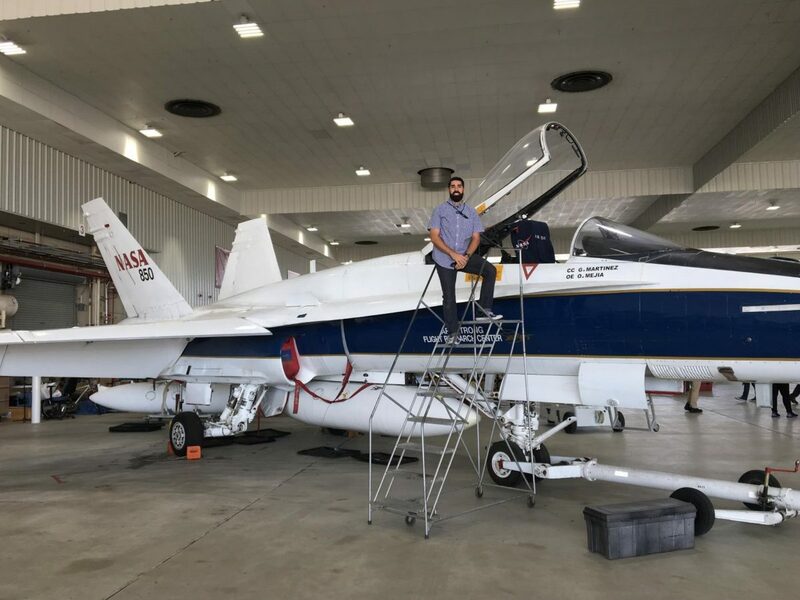 NASA intern Gabriel Almeida understands that learning new skills is the key to success. With what he’s gained while working on the Strategic Observatory For Infrared Astronomy, or SOFIA, there’s no doubt that he’ll soar. As a college student, sometimes it is hard to see the light at the end of the tunnel. As a student at California State University San Bernardino, working towards a degree in Computer Engineering and a minor in Physics, it took an inspiring experience to be reminded that it would all be worth it in the end. For me, my inspiration came in the form of an engineering internship on the SOFIA project at NASA Armstrong Flight Research Center. SOFIA, or the Stratospheric Observatory for Infrared Astronomy, is a 747 airplane that contains a large infrared telescope located towards the rear of the aircraft. The passenger cabin of the airplane has been converted into what is essentially a flying laboratory, with workstations for the telescope operators, mission directors, scientific instrument engineers, and the many other roles that each mission may require. Working on SOFIA is a unique learning opportunity because it is a program that is the intersection of so many complicated and exhilarating areas of study. Being a scientific airplane, there are aspects of aeronautics, computer science, astronomy, physics, electrical engineering, and mechanical engineering. Seeing how all these systems work together is a testament to the hard work and ingenuity of the many engineers and scientists who have contributed to the success of the program. Software Analysis- I have been able to continue to expand my software skills doing analysis of SOFIA archiver extraction software. Categorization of system hardware- I have spent many hours researching and categorizing boxes of flight and non-flight hardware, learning about how each piece of equipment is either used in flight systems or testing of those systems. Armstrong University classes- NASA Armstrong has created a university-style set of classes covering a broad range of subject matter that are available to all NASA Armstrong employees; qualified working professionals in several different fields of expertise at NASA have created courses that help create a work environment which encourages competency, succession, innovation, and job retention (Airworthiness 101, Research and Engineering, Communicating to Connect, and Leadership Principles). Certification courses- I have attended approximately 48 hours of lab instruction to obtain certificates in soldered electrical connections and surface mounted soldering. Increased exposure to NASA and other related aerospace facilities- In addition to an in-depth, behind the scenes walkthrough of the NASA Armstrong facility, the intern coordinator for Armstrong is constantly organizing guided tours and site-seeing opportunities of several industry-related facilities including NASA’s Jet Propulsion Lab, NASA Armstrong’s offsite facility, and the Space Company. Onboard flight observations- I am currently on track to fly on one of the SOFIA science missions. I will have a rare opportunity to watch NASA and DLR scientists in action as they perform the many different tasks that contribute to a successful flight onboard SOFIA. 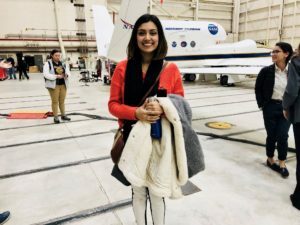 All of these experiences have successfully immersed me into an environment where I am constantly surrounded by engineers, scientists, and other industry professionals that are working on the frontlines of innovation in aeronautics and aerospace. I believe that one’s experiences are ultimately shaped by the attitude in which they approach them. With that mindset, I was willing to do whatever it took to be an intern with NASA. I knew that whatever task I was assigned, no matter how uncomfortable or tedious it may have seemed at first, was something that would I could learn from and would ultimately enhance my skill and knowledge level. Most importantly, being at NASA has helped me to put my education in perspective. Because of this experience, I see that personal success will not ultimately be measured by my GPA, but rather the problem-solving skills I have learned and the mentality I need when faced with adversity.